-- Please Select --See 'Stock Availability' tab below UK SIZE J UK SIZE J 1/2 UK SIZE K UK SIZE K 1/2 UK SIZE L UK SIZE L 1/2 UK SIZE M UK SIZE M 1/2 UK SIZE N UK SIZE N 1/2 UK SIZE O UK SIZE O 1/2 UK SIZE P Ring size not show? Ask for details. 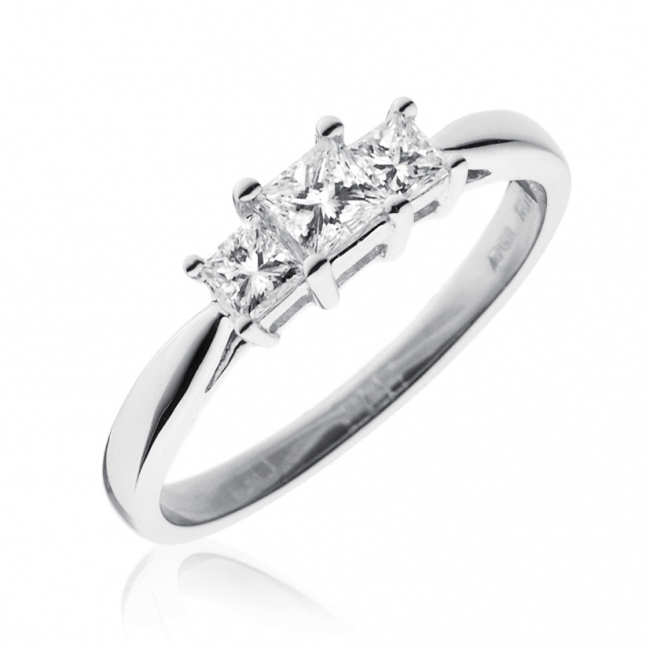 This beautiful diamond trilogy ring features three princess brilliant cut diamonds, claw set in solid 18k white gold. Featuring quality diamonds of at least G colour SI clarity. Delivered free with a quality gift packaging, authenticity certificate and a 12 month manufacturer backed guarantee.